Green Giant tomatoes are large, oblate fruits weighing anywhere from 12 to 32 ounces. Their smooth, bright green skin will remain green when ripe, and will develop a yellow-amber tint as they continue to mature. Their meaty and juicy flesh offers a complex spicy flavor that is balanced with a melon-like sweetness. The robust Green Giant tomato plant is tall and bushy, and it requires staking to support its large crops of the heavy fruits. Green Giant tomatoes are available year-round, with a peak season during summer months. Tomatoes are botanically known as Solanum lycopersicum or Lycopersicon esculentum, and their plants can be categorized by leaf type. Most tomato plants are regular leaf varieties with small, serrated leaves, while the Green Giant tomato plant is a potato leaf variety, characterized by dark green leaves that are large, smooth, and teardrop shaped, similar in appearance to a potato's leaves. Green Giant is the first known potato leaf variety of tomato to produce green fruit. Tomatoes are rich in vitamin C and vitamin A, which is important for healthy eyes, skin, bones, and teeth, and they are a great source of folic acid, fiber, and iron. They also contain good amounts of vitamin B and potassium, making them effective in reducing cholesterol levels and lowering blood pressure. 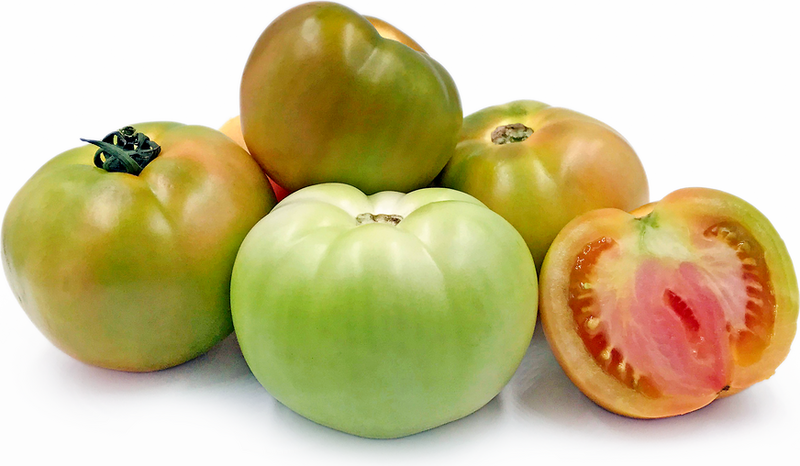 Green Giant tomatoes can be used in both raw and cooked applications. Their sweet and tangy flavor lends well for fresh salsa, and their large size is great for slicing and adding to sandwiches or salads. They can also be sautéed, roasted, smoked, breaded and fried, pickled, or cooked into sauce. Green Giant tomatoes pair well with both sweet and savory flavors, including melon, stone fruits, lemon balm, olive oil, oregano, basil, fennel, avocado, jalapeno, garlic, and soft cheeses. For best flavor, store Green Giant tomatoes at room temperature until ripe, after which they can be refrigerated to slow further ripening. When sliced, they will keep in the refrigerator for up to 2 days. The Green Giant tomato has had resounding success in multiple taste trials throughout the United States since its introduction in the early 2000s, such as at TomatoFest in Carmel, California, which still hails it as a favorite green tomato variety. Green Giant tomatoes were first cultivated in Germany by tomato collector, Reinhard Kraft. Kraft reportedly received the seeds from a friend in Canada, and only one grew to be a potato leaf variety, while the rest produced regular leaf plants. Kraft cultivated the potato-leafed tomato, selecting the best fruits and savings seeds for several seasons. In 2004, Kraft shared Green Giant tomato seeds with the renowned North Carolina gardener, Craig LeHoullier, affectionately nicknamed, "NC Tomatoman". Recipes that include Green Giant Heirloom Tomatoes. One is easiest, three is harder.